Interior from the north west. There are six registers at Oxton. Vol. I. consists of 66 leaves of parchment measuring 12in. by 71/2in. in a limp parchment cover with strong ties. It contains entries of baptisms and burials from 1564 to 1653 inclusive. Vol. II. consists of thirty leaves of parchment, measuring 15in. by 71/2in., stitched together, without cover. The first two leaves are badly holed, and the remainder of the volume is also in a bad condition. A leaf containing baptisms and burials for 1681, and some succeeding years, has been torn out. The volume contains entries of all classes from 1654 to 1700. Vol. III., bound in parchment, contains entries of baptisms and burials from 1721 to 1783, and marriages 1721—1753. Vol. IV. contains marriages from 1754 to 1783; Vol. V., marriages from 1784—1812. Vol. VI., bound in rough calf, contains baptisms and burials from 1783—1813. 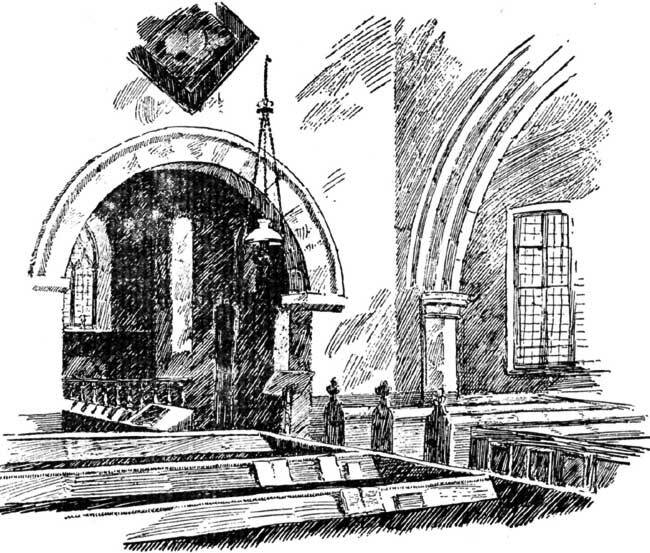 The marriages have been published, those in the first three volumes having been transcribed by Mr. T. M. Blagg, and the remainder by the present vicar, the Rev. Wm. Laycock. In Vol. I. some of the marriages and burials are mixed as:—"1564. The xix daie of November was Robt. Lupton and Jane Miller maryed. The same daie was John Gunthorpe buried." After this baptisms follow mixed with burials. "Anno dni 1568, for the Parish Church of St. Peter and Paul of Oxton, xi. concerning mariages, christenings, and burials as followeth." "1576. Thos. Risby, Clerke and minister, was buryed the xi day of the month of July, Ano dni." At the side of the entry a rude sketch of a hand is drawn to call attention to it. The family of Samon, amongst the gentry of the Oxton neighbourhood in the 16th century, are entered. They lived at St. Margaret's Grange, now known as Grange farm, which had formerly been Church property. Oxton, as before stated, was "without" the forest limits, but this means that it did not fall under the laws governing the land comprised in the Royal Forest of Sherwood, and not that the country round was cleared and cultivated. In fact, as late as the 16th century little difference would be seen between the forest proper, and Oxton parish, for the latter would consist largely of unenclosed lands and dense woodland, through which no roads ran. The only approaches to the village would be rude tracks, difficult enough to traverse in summer, and almost impassable in winter. The difficulties of travel were great, but the bands of lawless characters infesting these wild parts made it dangerous as well, and it was no uncommon thing to find the body of a murdered man lying beside the road track. Often enough the burial took place without any note being made of the circumstances attending the death, but occasionally, midst the bald entries of a parish register, a vivid picture is presented to us of the lawless times by a more detailed entry than usual. Such a one is the following, where a traveller was done to death in one of the fields in Oxton parish:—1576. "The xiiij of October, a certen yoong man, being a stranger and a travailer was found slayn and killed (in) Lovely Grange feild in the pshe of Oxton and was buryed in the churchyard of Oxton, the xvi day of October in Anno stipd." In 1585 is the marriage entry of one of Oxton's vicars: "Richard Burges Clarke and Agnes Harstap was married together the xxi day of October." This vicar died in 1614, described in the burial entry of June 17th in that year as "Sir Richard Burges, vicar of this parish." The use of the title "Sir" does not imply that he was a Knight, but was an honorary title given to priests down to a late period. A law of Canute declared a priest to rank with the second order of thanes—i.e., landed gentry. "By laws, armorial, civil and of arms, a priest in his place in civil conversation is always before any esquire, as being a knight's fellow by his holy orders, and the third of the three sirs," viz., Sir King, Sir Knight and Sir Priest. In Shakespeare's characters we have Sir Hugh Evans and Sir Oliver Martext, and at a later period still "Sir John" was the popular name for a priest. Piers Ploughman (vision xi, 504) calls them "God's Knights." Another instance of the use of Sir for Priest occurs in the Oxton registers in the marriage entry of Burge's successor, viz., 1614: "Sir Robert Huthet, vicar and Alice Baggeley." Many entries occur of two sur-names being entered for the same person, one an alias, of which the following is an example: "1595. Agnes Harstaf als Clarke, the daw of William Clarke was bapt. the vii day of July." Another example is the Custance family first entered as "distance alias Walker, but after the year 1615 as Walker alias Custance. It would be one of this family that Anne Thoroton married. Anne was the sister of Robert Thoroton the grandfather of the Nottinghamshire historian, and in his history, Thoroton records that the pair had a son called Robert Walker, an apothecary in London. This Robert died young "yet increased his brother Williams patrimony here (i.e., Oxton), and disposed of considerable sums of money very charitably amongst his kindred and others; his nephews Thomas, Robert and William, sons of his brother William continue owners of the land." These brothers then would be Oxton landowners at the time Thoroton wrote his history of Nottinghamshire. The following information is written on an odd sheet stitched into the Registers: "Anno dni 1577. "Margret Pygot widdow in her lyfe tyme gave towards mendynge balk in the body of the church vj.siij ; and towards tne releivinge of the poore for ever vls. "John Eaton, of Southwell, after the death of Henry Peacock his kinsman gave to the same use vls. "Thomas Knowles, yeoman, in his lyfe tyme gave to be employed uppon the poore for ever vls. "Elizabeth Knowles, widdow, in her lyfe tym gave xxs. "Willyam Keylow, yeoman, in his lyff tyme did constitute Willyam Clarke, alias Hardstaff his executor, and deliued until William Clarke hands certayn grounds lying within Eperston Cristin the wch lande Clarke sould to Mter John Chardworth of Southwell for viij livjs. vijjd. wch was in Clark's power to doe so that he and his heirs after him for ever should pay yearly to foure of the poorest aged people of this pish viij. at two feasts of the yeare that is to say uppon Saint Thomas day before the feast of the nativitie of Christ iiijs. And uppon Good Fryday other iiijs. "William Samsan, gent citicen of London, born in this townne of Oxton gave vli to be imployed uppon the poore for ever. "William Sheirbroock (rubbed out) in his lyff tyme delivered unto the hands of Robte Sheirbrooke gt xiijs., iiijd. towarde erectinge a clock yt there happened at any tyme to be on, els not, but Mr. Sheirbrooke to haue to his ownn pvopper use for ever. The whole sum of the stocke for the poore A.D. 1620, was vi li." "A copnye of all the Christninges marages and burialls delivered in to the hands of the Ordinary of Southwell accordinge to the article of our Injunction for the yeare past anno dom 1600 and from March till the fyrst of June ano dom 1601." "The churchwardens shall once every yeere within one month after the 25th day of March, transmit unto the Bishop of the Diocesse or his Chancellor, a true coppy of the names of all persons christened, married, or buried in their parish in the yeere before (ended the sayd 25 day of March), and the certaine dayes, and moneths in every such christening, marriage, buriall was had, to be subscribed with the hands of the sayd minister and churchwardens, to the end of the same may faythfully be preserved in the Registry of the sayd Bishop, which Certificate shall be received without fee."